Looks like things are damn near back to normal. I've had a week of shooting and riding for fun. Some of these were shot from the bike and I covered about 700 miles in the week. 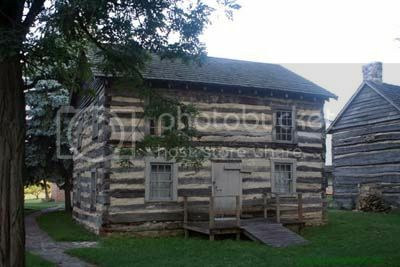 Fourteen of the twenty-two photographs this week were shot while I was out tooling around the Alleghenies and eastward. 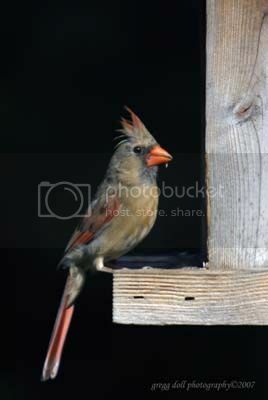 Female Cardinal sitting on the feeder. This picture was taken at 9:30 in the morning just as the sun was coming over the roof of the house. The black background is actually the tree line at the edge of our yard. The aperture is 5.6, the shutter speed is 1/1000 of a second, the ISO is 400 and my focal length was 400 mm. 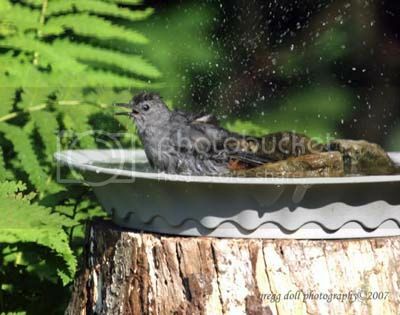 Catbird taking a bath in my $2 bath tub. 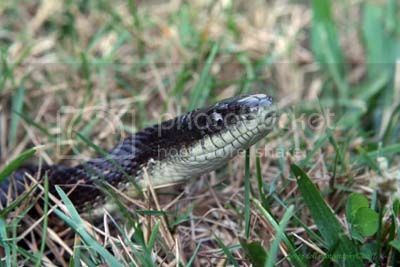 As I was cooking supper one night I caught this snake rambling across the yard. 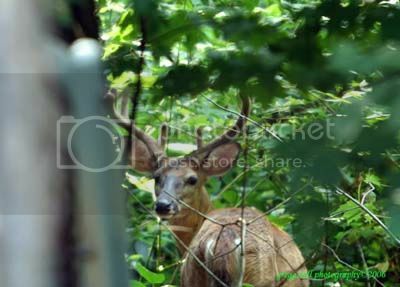 This shot of an 8 point buck with it's rack still in velvet was also shot at the edge of our yard in the middle of the afternoon. The next five pictures were all taken while I was out and about on my chrome pony. 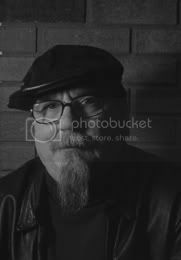 An ex-military LOACH in civilian attire. This is the Knox Community Hero by Gretchen C. Mason of Shippenville, PA. From what I can gather, several years ago each of Pennsylvania's 67 counties was asked to adopt a wild animal as it's county's mascot. 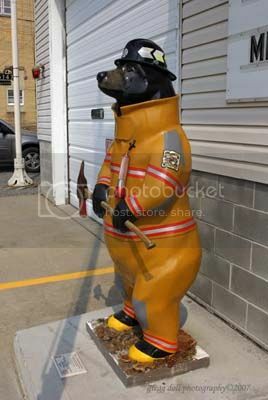 Clarion County chose the bear. This one sits in front of the Knox Volunteer Fire Company. 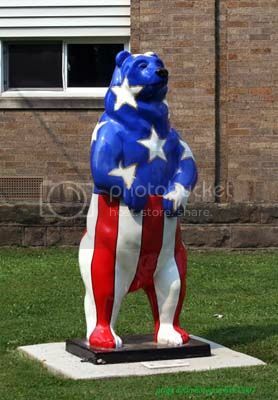 Beary Sweet Freedom is the work of Ruth Hirsch of St. Petersburg, also in Clarion County. The statue sits in front of the St. Petersburg Community Center. 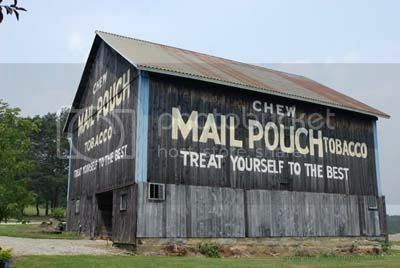 Located at Sawyer's Nursery in Corsica, PA is this nice example of a Mail Pouch barn. As you can see, the two sides that face the highway (Route 322) are painted. 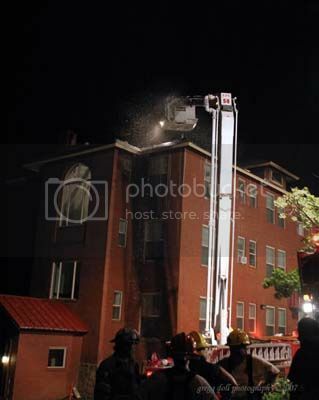 This early morning (3 a.m.) blaze was in Spangler in the old Miner's Hospital Nurses building which had recently been renovated and contained a Head Start Center and apartments for the handicapped. The building, which was struck by lightning during an overnight storm, was not a complete loss due to quick action by the fire department and a substantial fire wall. 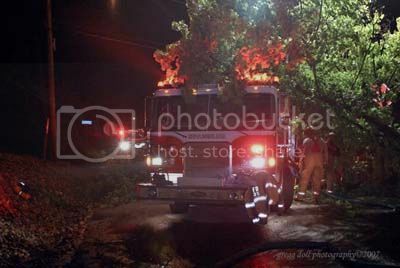 I'm not exactly sure how it happened, but a tree that was in the way of this fire truck was in the process of being removed when it fell on the fire engine. It was a good week for bike riding and I took advantage of it. My tour went from Hastings, to Bedford, PA down to Hagerstown, MD, up to Chambersburg, PA across Route 30 to Bedford and home again for a total of 298 miles. 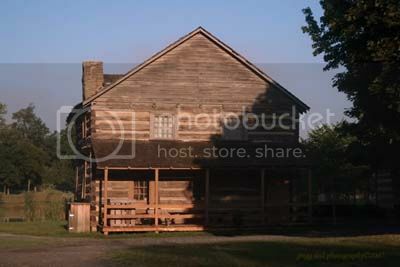 Along the way I stopped at Old Bedford Village and took these first two pictures. 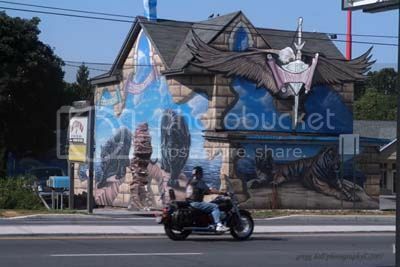 Located in Chambersburg, PA is this building along Route 30 which houses the tattoo shop of Eric Von Dar. 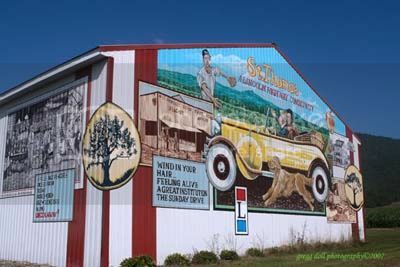 Another example of the Lincoln Highway painted barns west of St. Thomas, PA.
Belonging to the Army National Guard is this C23 Sherpa. It was built by the Shorts Brothers of Belfast, Ireland. The Sherpas are only manufactured for use by the Army National Guard. The civilian version of this plane is known as the short 330 and the SD3-30. 65 foot wing span, 52 feet long. The plane is powered by two 1700 HP Wright R2600-92 engines. 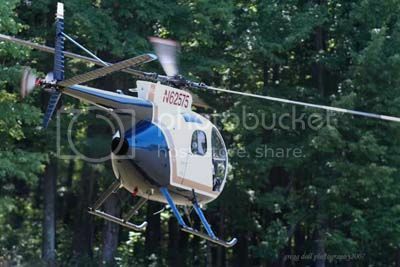 Top speed is approximately 270 miles per hour. This particular plane was built at the North American Aviation Factory in Kansas City, KS in August 0f 1944. 103 foot wing span, 74 feet long. 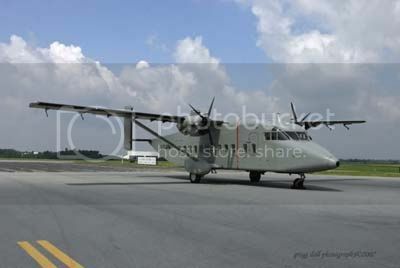 The plane is powered by four 1200 HP Wright R-1820-97 engines. Top speed was 250 miles per hour. The plane was built by Boeing in April of 1945. This plane means something to me as my Uncle Stu was a waist gunner during WWII. He was shot down and spent three years as a POW in Stalag VII/A. 110 foot wing span, 67 feet long. 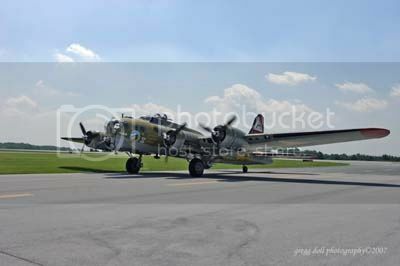 It had four 1200 HP Pratt and Whitney R-1830-65 engines. It had a top speed of 290 miles per hour. 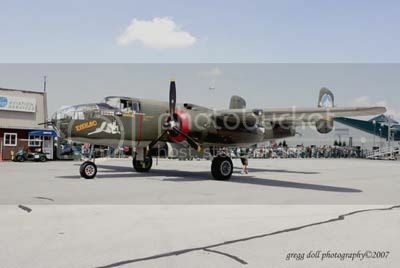 It was built by the Consolidated Aircraft Company of Fort Worth, TX in August 1944. 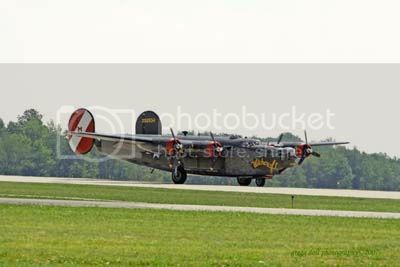 It is the only restored B-24 flying. 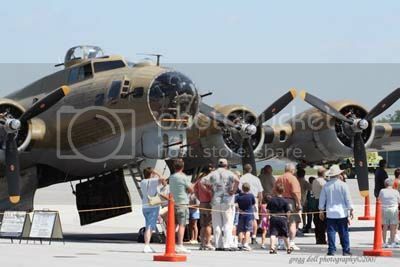 Standing under the nose of the B-17 the crowd turns to watch the B-24 taxing on the tarmack. 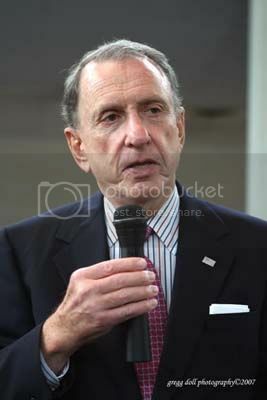 Pennsylvania Senator Arlen Specter held a town meeting on the campus of Saint Francis University yesterday, Wednesday, August 15, 2007. Senator Specter addressing the crowd prior to his brief 45 minute question and answer period. 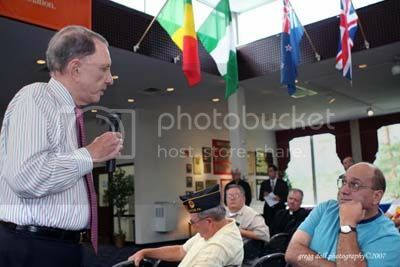 This retired bank manager looks somewhat skeptical as he listens to Senator Specter reply to his question about loopholes and lack of action concerning immigration. When was the fire at the Old Miner's hospital? 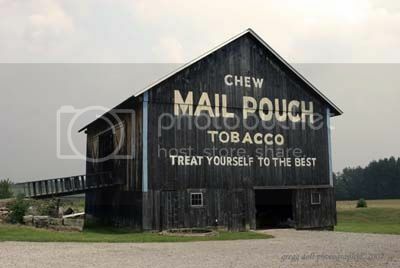 Have you been out to see the "picture" on the top floor of the building? I'm wondering if it's a result of the lightening/fire?